Seaside Retreat 2 blocks from the beach. 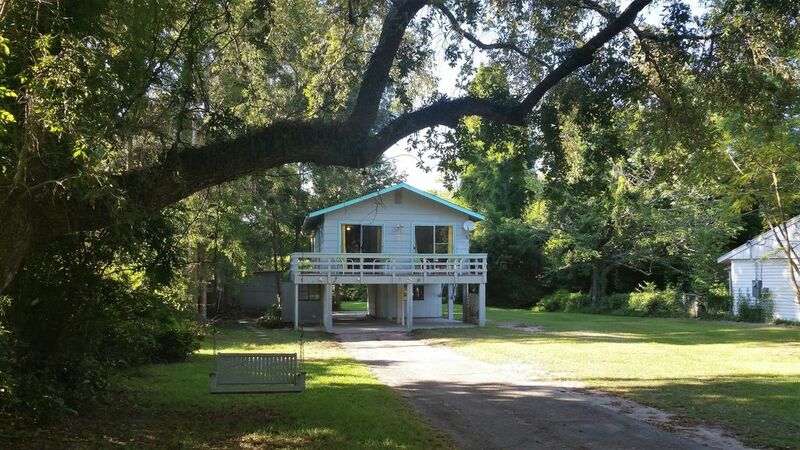 2 bedrooms, 1 bath Southern Mississippi Coast! We enjoyed our recent stay in Pass Christian. If you are unfamiliar with the area, there are a string of communities along the coast that have restaruants, harbors, piers, and shops - Bay St. Louis, Pass Christian, Long Beach, Gulfport. The area is within driving distance of New Orleans, LA one direction and BIloxi, MS in the other. Be aware that the beaches and water aren't the pristine clearer water that is found further down the Gulf but during springtime/cooler weather, it is a nice area to just go and look at the water and get your beach time. The house itself is only a couple of blocks from the beach/gulf. There is a balcony that spans the front of the home and if one peeks through the trees you can spot the water! The outdoor area is nice in the mornings for a cup of coffee and for a relaxing glass of wine in the evenings. There is a washer/dryer in a storage room downstairs (having laundry facilities is a huge plus for me when on vacation) and laundry detergent was provided. There is covered parking but it has low clearance so we just parked in the driveway. As also noted in the description - there are railroad tracks right behind the house! As I have a husband who loves trains, this was not a problem for us. And you really do get used to it after the first few times. There is a Walmart only a mile or two down the road for anything you might need. Pirate's Cove is good for po'boys and is within walking distance. We personally recommend Steve's Marina in Long Beach for a dinner out. Overall a good stay at a good property! Thanks for your kind and detailed review! We are planning on replacing the bath tub/shower in the not too distant future. Glad you enjoyed your stay. My 3year old daughter and I enjoyed a little girls trip together. This home is near the beach and downtown. The home is very clean and has a great balcony that adds to the usable living space. As the owner mentions the train will pass by. I was surprised at first, but my daughter took it in stride and it was not a major issue. I think anywhere in Pass Christian you will experience the train. It was a perfect place, close to the beach. We enjoyed our stay and liked the house. We also liked the covered parking. We got use to the train.it was cool. Mr Carlotta was available and replied to our questions promptly. Super Cute, quaint, and very home away from home. It was perfect for our family vacation. It has linens, fully stocked kitchen (minus food) coffee pot, you name it, it was there; even has a BBQ down stairs. The decor was super cute. The neighbors were super nice. It was just a couple of blocks from the beach which we LOVED! It was the perfect location. Only 45 mins from New Orleans and just a couple of hours from Florida. The town was so quiet and everyone in town was super nice and helpful. We bought some boogie boards for the beach & left them for the next family. Hopefully they will have as much fun on the beach as we did. I loved sitting on the balcony of an evening with a glass of wine and just relaxing. Can't say enough how amazing our stay was. We have already decided we will most definitely be staying again next year if it is available. What a sweet review! Thanks for the boogie boards! You are welcome to our vacation home anytime! Loved having beach within walking distance and little restaurant only a few steps away was a plus. Train behind house was a surprise but the 3 year old train lover with us thought it was the coolest. Booking and checking in were quick and easy...would stay here again. Plenty of room for boat or other recreational vehicles. Enjoy the old south with it's Live Oaks and stately Southern Mansions. Ride your bike down Scenic drive and enjoy the restaurants, boutiques and harbor. Casinos and more beach life nearby! Sorry no pets.